With 2 faulty chargers it was time to see if they could be repaired. 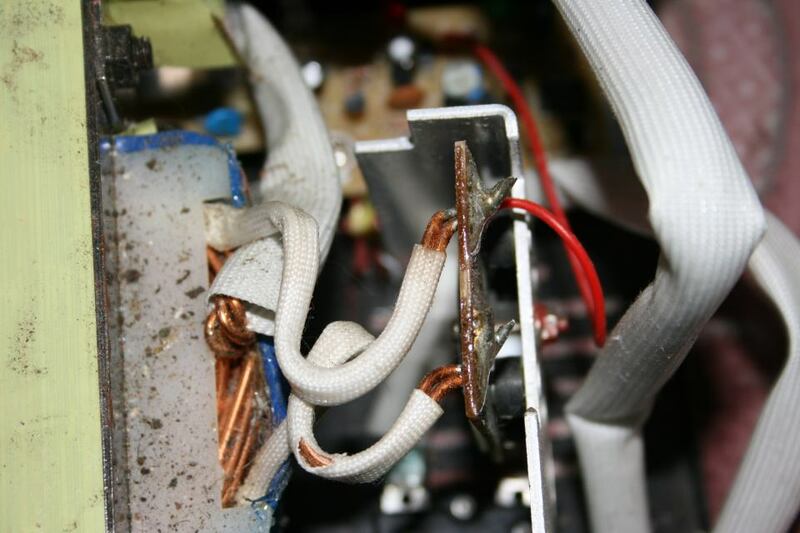 Before making similar repairs it is a good idea to complete the tests on the previous page, that will save wasting money buying transistors if the transformer is burnt out. Printed circuit board fixing screw in orange. The insulation has melted on one wire. The incinerated output switching transistors in the original faulty charger and the second hand charger. 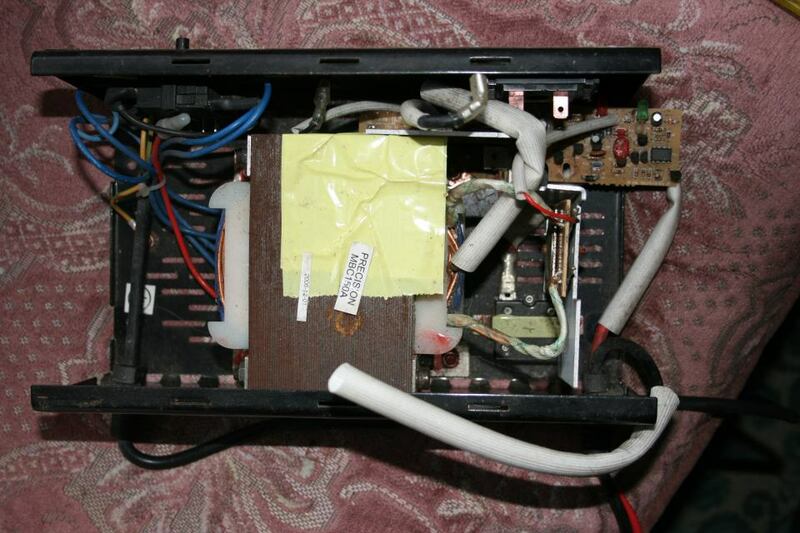 Note the additional high power 0.5 ohm resistor fitted to the original unit. 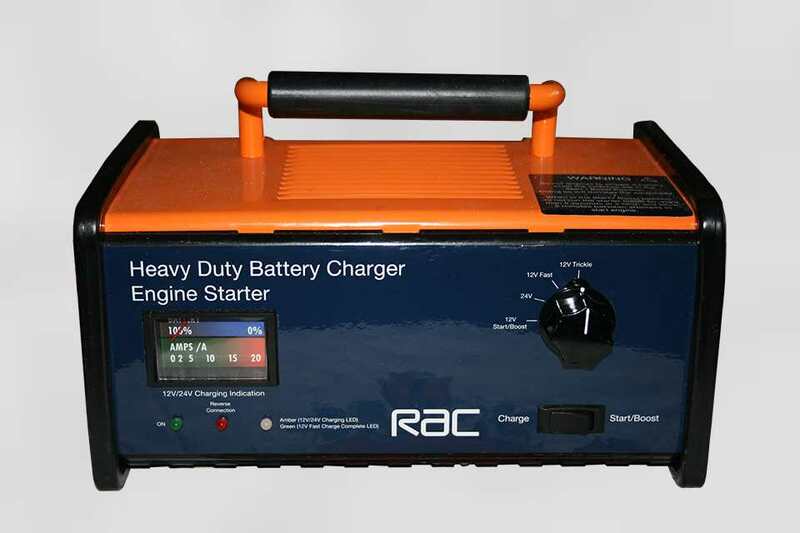 This has been added to restrict the charging currents, probably to try to reduce failures. The red line is presumably a manufacturing mark. The faulty transistors had become so hot all the identification markings had been burnt off. 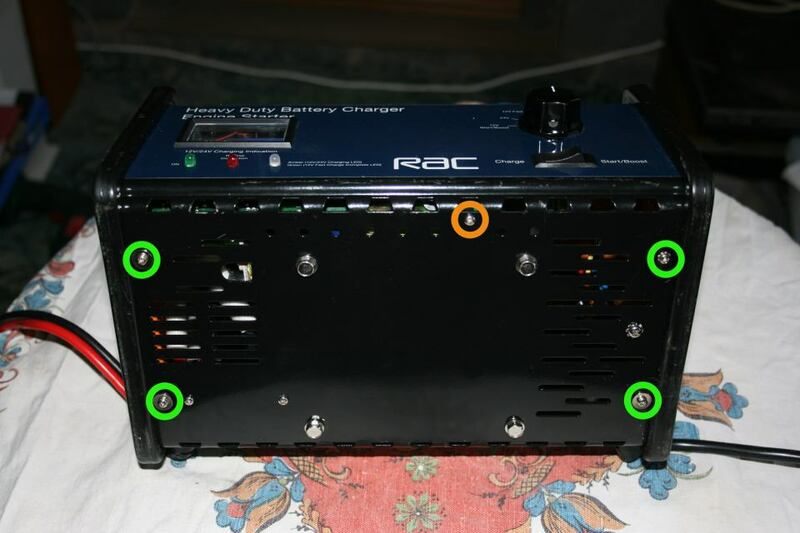 Fortunately we had one working charger which identified them as International Rectifier power Mosfets IRF3205. I purchased 2 for each faulty unit plus a couple of spares from Ebay for about £1.50 each. Even cheaper in September 2014 for £2.69 post free I bought a pack of 10 on Ebay from Hong Kong, 27p each. Original charger with the cover removed. Pcb fixing screw. 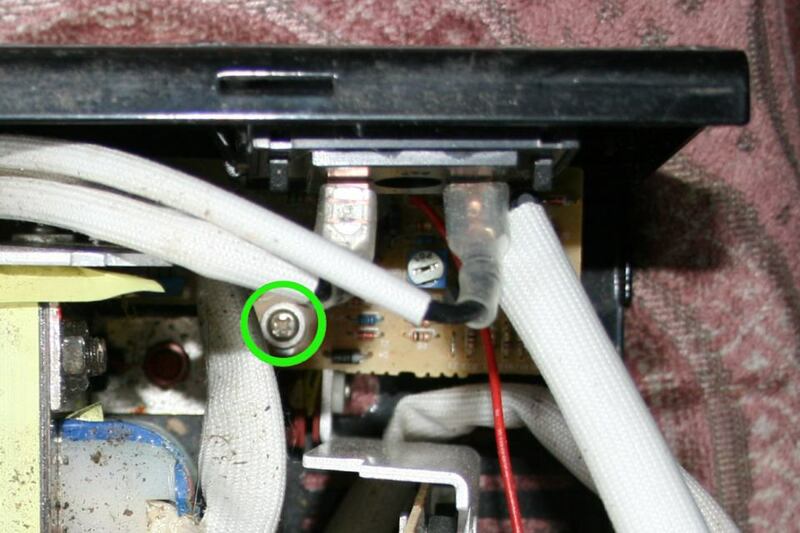 Do not lose the star washer hidden under the pcb. Pcb partly out on our working charger. 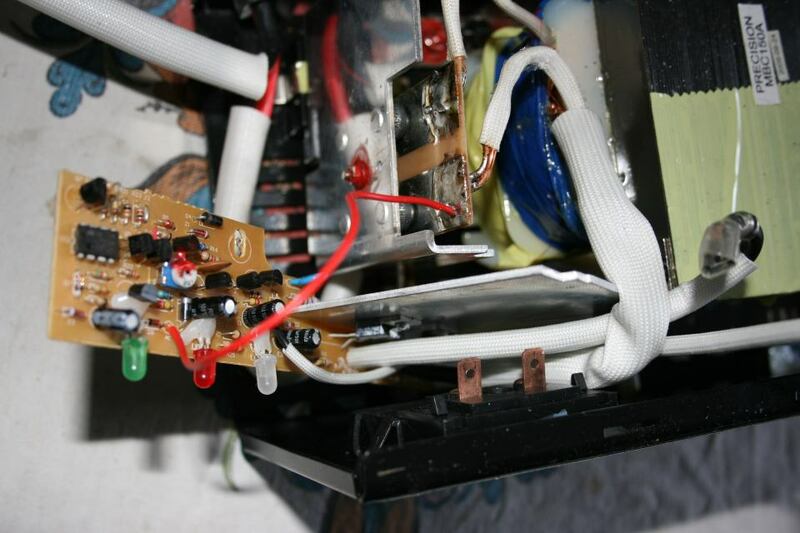 Wire on the second hand charger wrapped round the transformer wires stopping the pcb being swung out. Like the first one this also has melted insulation on the transformer wires. 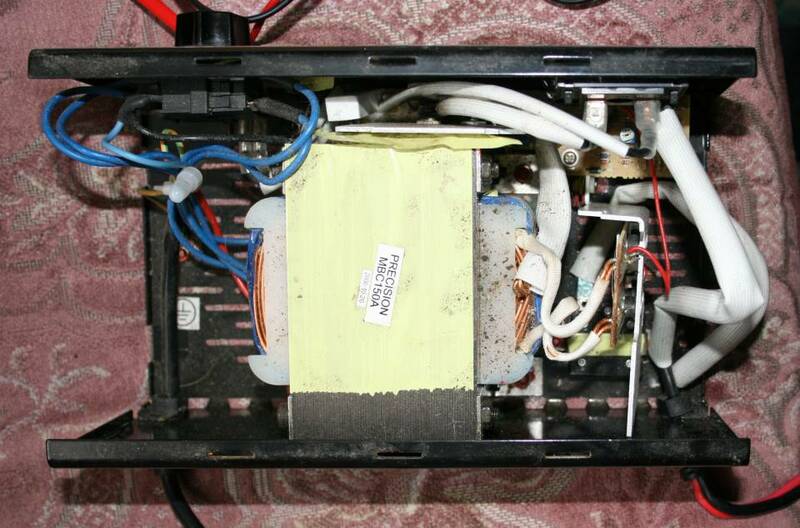 My first check was the transformer, if it was burnt out the charger would not worth repairing. 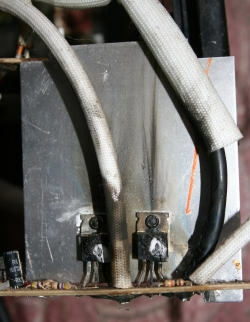 On both chargers the white insulation on the transformer wires had partially melted indicating high temperatures. The centre tap wire goes to the main printed circuit board so the voltage was measured across the two output wires. 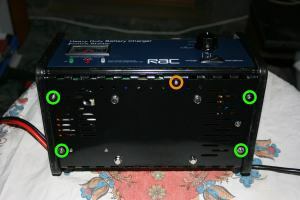 With the rotary switch in the Trickle charge position it measured about 21 volts ac and in the High position 27 volts ac. This gives 10.5 0 10.5 volts on trickle charge and 13.5 0 13.5 volts on high charge, which was reasonable. The power diodes tested ok, both of these tests are described on the previous page. Tip: Photograph the wiring to the printed circuit board before removing the board, especially the thick cable route from the transformer as it can help when trying to manoeuvre it back into position. The connectors on the meter and the toggle switch were disconnected. 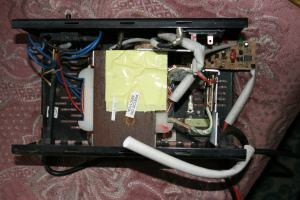 The main printed circuit board (pcb) had to be released by removing two screws. My advise is not to unscrew the one furthest away from the meter from the inside unless it makes it easier to remove the pcb, I found it very difficult to line up that screw to reassemble, unscrew from beneath the charger. The other fixing screw had a star washer fitted under the printed circuit board instead of the normal position under the screw head, take care not to lose it. On the second unit the red wire was wrapped around the wiring and had to be unsoldered. 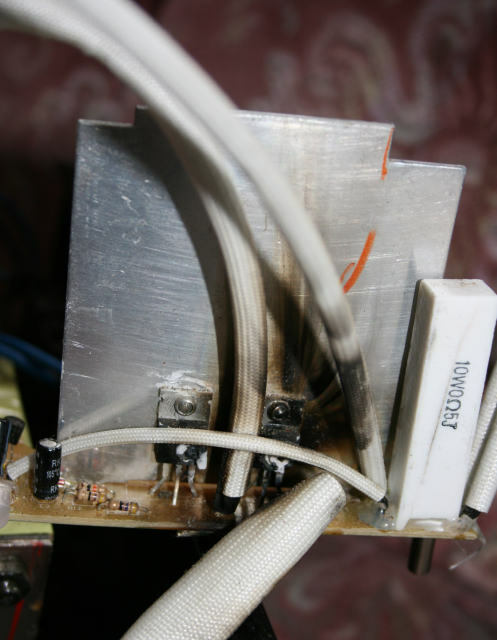 It was not easy to get out but the pcb could be moved sideways and rotated out to the side revealing the source of the smoke. It may help unsoldering the thin red wire and there are possibly two different ways of getting the board in and out, note it does take some patience. If the wires were shorter it might not be possible.